In this form, I'm using the spinner and form collapse. If the answer to the first question is 'No', the form is submitted. If the answer to the first question is 'Yes', then another question appears. Action starts for the spinner, showing as many form collapse as indicated in the answer to the second question. The problem is when, after saying 'Yes' in the first question, I go back to the first question and change my answer to 'No'. Then, I can't get rid of the first form collapse heading. Any ideas? This is because the "How Many?" is still true even though it is set to hidden. You can set a much more stricter rule. Condition 1: IF "Do you have kids living with you at the moment?" 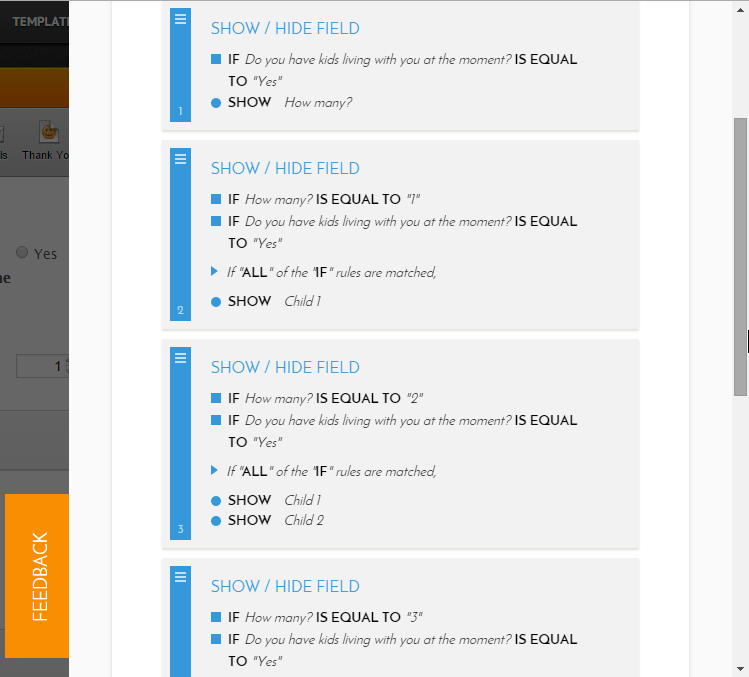 is Equal To "Yes", then SHOW the field "How many?". Condition 2: IF "How many?" is Equal to "1" AND IF "Do you have kids living with you at the moment?" is Equal to "Yes" then show "Child1" form collapse field. Repeat condition 2 on the other form collapses. Just a quick question about formats. In my first radio button field, the label is quite long: 'Do you have...?'. I'd like to move the options to the right and maybe have the question in one line. Is it possible such a thing? Thank you for confirming the Form Collapse condition is now resolved.